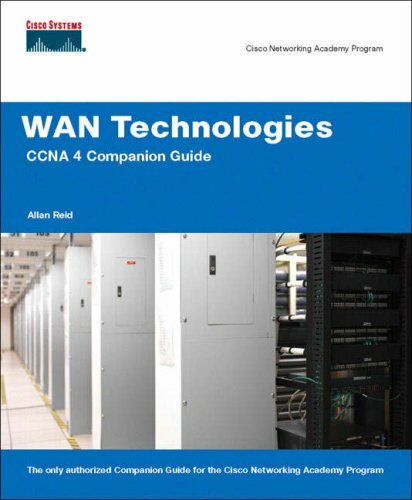 WAN Technologies CCNA 4 Companion Guide is the official supplemental textbook for the CCNA 4 course of the Cisco Networking Academy Program. Completely revised from the previous edition with new examples and explanations, this textbook includes original material developed by the author, yet it fully aligns with the CCNA 4 curriculum. Written by an experienced author who present material in a comprehensive manner--using his own voice and own examples--this new edition augments student understanding of course material. The new edition incorporates improved features to aid instructors and enhance student comprehension. For example, chapters align with course modules in both name and number, and chapter objectives are stated as questions to encourage students to think about and find answers as they read chapters. End-of-chapter questions and summaries align with chapter objectives to emphasize key topics, while key terms are listed in each chapter opener in the order of occurrence to alert students to upcoming vocabulary words. In addition, new features include "How To" quick references for step-by-step tasks; real-world examples and all-new illustrations; concise explanations with a focus on word usage and sentence structure for improved readability; and correlations to the CCNA exam in Chapter Objectives, Check Your Understanding questions, and new Challenge Activities. WAN Technologies CCNA 4 Companion Guide is the official supplemental textbook for version 3.1.1 of the CCNA® 4 course in the Cisco® Networking Academy® Program. The author has completely rewritten the Companion Guide to provide a fresh, complementary perspective on the online course content. The book covers all the topics in the course and then provides additional examples and alternative approaches to individual topics–all to aid the learning process and lock in your understanding of basic networking concepts and technologies. Chapter objectives: Review core concepts by answering the questions at the beginning of each chapter. Key terms: Refer to the updated lists of networking vocabulary introduced in each chapter and turn to the highlighted terms in context. Glossary: Consult the all-new glossary with more than 300 terms. Check Your Understanding questions and answer key: Evaluate your readiness with the updated end-of-chapter questions that match the style of questions that you see in the online course assessments. The answer appendix explains each answer. Challenge questions: Challenge yourself with review questions designed to be similar to the complex questions you might see on the CCNA exam. The answer appendix explains each answer. Allan Reid is the curriculum lead for CCNA and a CCNA / CCNP® instructor at Centennial College CATC in Toronto, Canada. He has been teaching the CCNA curriculum to both students and instructors since CCNA version 1.1 and has been instrumental in the development and implementation of numerous certificate, diploma, and degree programs in networking. Outside of his academic responsibilities, Allan has been active in the computer and networking fields for more than 25 years and is currently a principle in a company involved in the design, installation, and management of network solutions for small and medium-sized businesses. Packet Tracer Activities: Create simulated networks and visualize how packets flow in the network using Packet Tracer v3.2 developed by Cisco Systems®. Lab References: Stop when you see this icon and perform the related labs from the online curriculum. WAN Technologies CCNA 4 Labs and Study Guide by John Rullan (ISBN: 1-58713-173-0). Cisco Press provides additional content that you can access by registering your book at ciscopress.com. Membership and registration are free and give you access to Packet Tracer configuration files, additional content from Cisco Press books, and exclusive deals on other resources from Cisco Press. This book is part of the Cisco Networking Academy Program Series from Cisco Press®. The products in this series support and complement the Cisco Networking Academy Program onlinecurriculum. Allan Reid is the Cisco Academy Main Contact and Curriculum Lead for the Centennial College CATC in Toronto, Ontario, Canada. He has taught cabling, routing and switching, remote access, troubleshooting, wireless networking, and IT essentials to instructors from uni­versities, colleges, and high schools throughout Canada. He has been working in the IT indus­try for more than 20 years and is currently a principal in a company specializing in network design, management, and security. He is a professor and program supervisor at Centennial College, teaching students in various areas of networking and IT. He is responsible for the col-lege’s CE offerings in IT. In addition, he works as a contractor for Cisco Systems, working on curriculum development and the creation of assessment questions for the Cisco Networking Academy Program courses. He has also served as a technical reviewer for other Cisco Press publications.